According to multiple reports, the sales of VW Polo have been suspended with immediate effect. 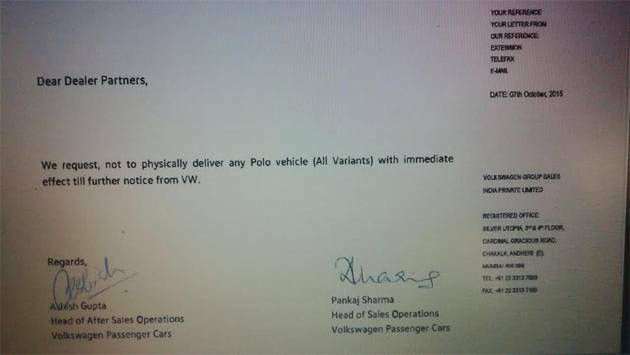 The dealers are reported to have received a letter from Volkswagen, asking them to stop the sales of all variants of the Polo hatchback. While the reason behind the move remains unclear, a VW official has, in a reply to Autocar India, confirmed that the stoppage of sales is not related to the whole ‘diesel gate’ saga going around. A PTI report, on the other hand, hints at it being due to a a different ‘technical issue’. A formal reply from the company is expected soon. Since the Polo shares its platform with a number of products in India, had there been a flaw, VW could have stopped the sales of Vento and Skoda Rapid, as well. But that hasn’t happened yet, so it’s likely to be a smaller issue than what most investigative minds might make you believe. “a technical reason which is currently under evaluation. This concerns a limited number of cars out of a specific production period. Volkswagen further confirms that deliveries for the non-impacted Polo range continues as schedule.